Loja Wildlife, Granada Province, Spain. 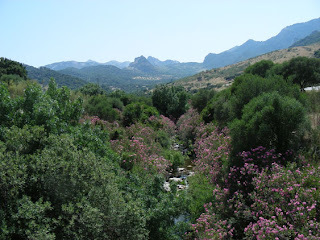 : Ronda and Grazalema, Malaga Province. Ronda and Grazalema, Malaga Province. We've had a full day of it! David and Pauline were visiting us from the UK so we decided that we would pay a visit to Ronda and the white villages near by. On the way over we stopped off at Laguna Dulce to have a look at the small flock of about 70 Greater Flamingo's (Flamenco Común / Phoenicopterus ruber) which were on the near shore and could be viewed easily. There were at least 2 none breeding adult Slender-billed Gulls (Gaviota Picofina / Larus genei) feeding amongst the Flamingo's legs, Black-headed (Gaviota Riedora / Larus ridibundus) and Yellow-legged Gulls (Gaviota Patiamarilla / Larus Michahellis) were also there in good numbers. At least 50 Gull-billed Terns (Pagaza Piconegra / Gelochelidon nilotica) fed over the nearby fields and skimmed the lake surface, along side a few Whiskered Terns (Fumarel Cariblanca / Chlidonias hybridus). Birds on the lake were few and too distant to Id with out the scope but we did manage to pick out Eurasian Coot (Focha Común / Fulica atra), Common Moorhen (Gallineta Común / Gallinula Chloropus), Common Pochard (Porrón Europeo / Aythya ferina) and Little Grebe (Zampullín Común / Tachybaptus ruficollis). We then headed towards Ronda picking up a pair of Bonelli's Eagles (Aguila-azor Perdicera / Hieraaetus faciatus) low over the road and a few distant Griffon Vultures (Bultre Leonado / Gyps fulvus). Once in Ronda we walked the main shopping street before reaching the gorge where I saw Lesser Kestrels (Cernicola Primilla / Falco naumanni), Pallid (Vencejo Pálido / Apus pallidus), Common (Vencejo Común / Apus apus) and Alpine Swifts (Vencejo Real / Apus melba), Crag Martin (Avión Roquero / Ptyonoprogne rupestris), Blue Rock Thrush (Roquero Solitario / Monticola solitarius) and Rock Sparrow (Gorrión Chillón / Petronia petronia). Lunch was the next stop in the small village of Benaoján; we all had a very good Menu del Dia. 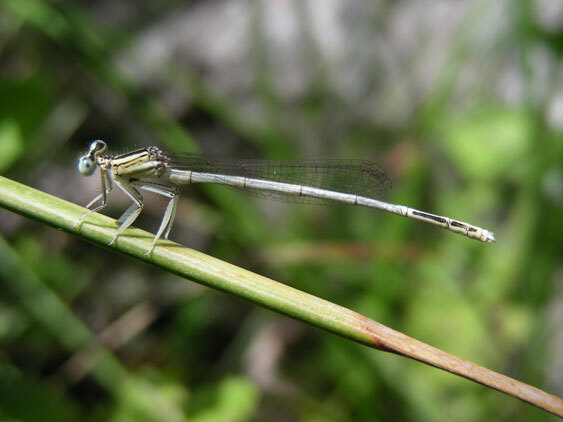 We then pushed on up to Grazale ma where I dropped off Jayne, David and Pauline while I went to have a look at Steve's Bridge where I had seen several interesting Dragonflies the week before but what a difference, the only species seen were White Featherleg (Platycnemis latipes) and Copper Demoiselle (Calopteryx haemorrhoidalis). 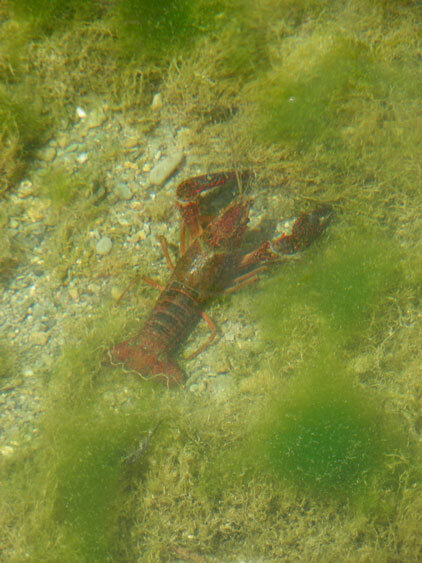 I did manage to see a Crayfish which I suspect is one of the introduced American Signal but awaiting some confirmation. I returned to the village met the others and went and popped into the visitor centre for a quick chat with Clive. A little later we made our way home via a garage for ice creams. Photographs from the top: In Ronda, Crayfish Sp, View from Steve's Bridge and White Featherleg (Platycnemis latipes). Great to see the lovely view from "Steve's Bridge" again after 3 months away from the place, I'm hoping that the dragons will be back in force by mid August.